Laser Photonics’ Canyon™ family of industrial-grade 3D laser engraving machines have been designed specifically for 3D deep engraving applications emphasized for superior edge quality and fastest processing time. The Canyon™ family incorporates high wattage Fiber or CO2 lasers incorporating a proprietary combination of high energy pulses for deeper material penetration creating perfect edge quality with straight & smooth walls in unmatched cycle times. These systems are specifically designed for high speed metal removal with no re-melting while being able to perform enhanced 3D image details and finesse laser engraving. The Canyon™ Deep-Engraving Laser System is designed to support both circumferential and flat deep-engraving applications or with the rotary motor removed, larger flat deep-engraving requirements. Fonon Corporation’s Canyon™ Deep-Engraving System is the most flexible industrial-grade marking & engraving system in the 3D material processing industry designed to operate under high-vibration, shock and dust conditions. With an oversized enclosure, both circumferential marking and flat marking including UDI/UID barcodes, logos, deep-engraving and many other Direct Part Markings are permanent, legible and non-removal. The Canyon™ Deep-Engraving System incorporates Fonon’s proprietary Software designed to specifically run on the Windows 7 Platform. The Canyon™ unit is configured with a 50W Fiber laser or 100W CO² SLAB laser with a vacuum table and blowers to ensure the highest quality mark for applications with depth requirements > 0.003”. The Canyon™ Deep-Engraving System is an industrial-grade, complete turnkey laser-based system incorporating a programmable 8” Z-axis for focal height adjustments with 2 optical X’Y’ axes increasing the range of the marking area. 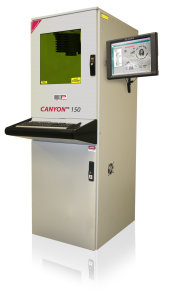 The Canyon™ system incorporates a movable Rotary Indexer, 50W Fiber Laser or 100W Fantom SLAB laser, Scan Head, Industrial PC Controller and Power Supply. The Canyon™ can be configured with or without the rotary motor. The key to the highest quality mark is the addition of a vacuum table and directional blowers that continuously remove debris from the processing area to ensure perfect edge quality with straight & smooth walls in unmatched cycle-times. The Canyon System uses a unique combination of high energy pulses for deeper material penetration designed for high-speed removal with no re-melting of the material while performing enhanced image detailing and finesse deep-engraving. The Canyon™ system produces a wide variety of Permanent, Legible, Non-Removable Marks on a wide variety of materials.